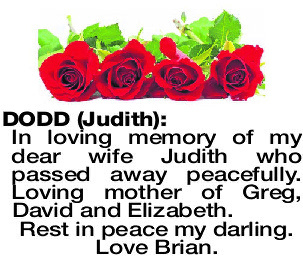 In loving memory of my dear wife Judith who passed away peacefully. Loving mother of Greg, David and Elizabeth. Rest in peace my darling. Love Brian. 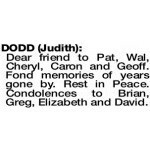 The Funeral Service for the late Judith Alice Dodd of Willetton will be held in our Mareena Purslowe Chapel, 103 Norma Rd, Myaree at 10.30am on WEDNESDAY (24.4.2019). 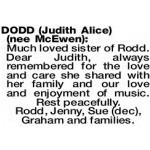 Much loved sister of Rodd. 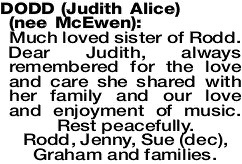 Dear Judith, always remembered for the love and care she shared with her family and our love and enjoyment of music. Rest peacefully. Rodd, Jenny, Sue (dec), Graham and families. Dear friend to Pat, Wal, Cheryl, Caron and Geoff. Fond memories of years gone by. Rest in Peace. Condolences to Brian, Greg, Elizabeth and David.